In September of 2012, in Snohomish County, WA, Mary Mazalic was brought to trial for starving, beating, and burning a ten-year-old girl. Senior Deputy Prosecuting Attorney Lisa Paul filed a motion in limine to ask the court’s permission to allow facility dog Stilson to sit at the feet of this child victim while she testified in court. Her brief included an affidavit from victim advocate Heidi Potter, Stilson’s handler, documenting how Stilson provided comfort to this child during the investigative phase of these crimes. The judge found that this child suffered emotional trauma from these events. The defense did not object to the presence of Stilson with the agreement that he would be concealed by the witness box and the jury would not be aware of his presence. While in the witness box, Stilson remained calm and out of sight during the lengthy direct and cross-examination. He did not even move when defense counsel spilled a glass of water into the witness box and several people moved to this area to clean up the water. The defendant was convicted as charged. After the trial, jurors stated they did not know that a dog was in the courtroom. Stilson, the invisible dog, was bred, raised, and trained by Canine Companions for Independence. His behavior exemplifies the high level of training of a facility dog. This is only one of numerous success stories of facility dogs assisting in criminal, juvenile, and drug courts. Additionally, these dogs visit juveniles in detention facilities and are a friendly presence during their recovery process. Currently, there are courthouse dogs working in twenty-one states: Arizona, California, Colorado, Hawaii, Idaho, Indiana, Louisiana, Massachusetts, Michigan, Missouri, New Hampshire, New Mexico, New York, Ohio, Oklahoma, Pennsylvania, Tennessee, Texas, Utah, Virginia, and Washington. The unconditional love and support the courthouse dogs offer juveniles make them a positive counterbalance to the often overwhelming and stressful setting of the courts. The placement of dogs in the courthouse is a wonderful program, which hopefully, will continue to grow and be implemented in more courts throughout the country. Above Photo: Courthouse dog Russell, trained by Assistance Dogs of the West, works at the Southern Arizona Child Advocacy Center with Director Kathy Rau. Photo courtesy Courthouse Dogs Foundation. Intro Photo: Molly B at the King County Courthouse. 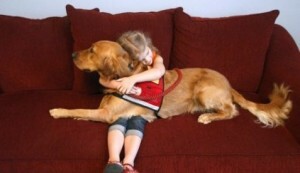 Molly B was bred and trained by Canine Companions for Independence. Photo courtesy Courthouse Dogs Foundation and the Seattle Police Department. For more information regarding the Courthouse Dogs Foundation or for starting a program for the use of courthouse dogs, visit courthousedogs.com.